Calling all owners of Cummins-powered vehicles. Once your Cummins engine reaches 100,000 miles, your membership in the Cummins High Mileage Club awaits. Cummins’ reputation for building durable, world-class engines is supported by the effort you take to maintain your engine. We're inspired by stories of customers who drive their Cummins-powered vehicles hundreds of thousands of miles. The High Mileage Club is our way of saying thanks. Since its inception in 2010, the club has welcomed more than 1,400 members. When you join, you can tell your Cummins story online and share tips with other members on how you keep your engine running strong. What types of vehicles are eligible for the High Mileage Club? Any Cummins-powered vehicle with an odometer can qualify you for membership in the High Mileage Club. That primarily includes on-highway vehicles such as pickups, medium- and heavy-duty trucks, motorhomes and more. After joining the club, can I order grill badges for previous 100,000-mile milestones already reached? After joining the club, you will be eligibile to order one grill badge displaying your latest mileage milestone. As you achieve additional 100,000-mile milestones going forward, you will be able to order a new grill badge at every 100,000-mile milestone thereafter. What will I need to submit in order to receive my next grill badge? To receive your next grill badge recognizing a new mileage milestone, please update your profile information, selecting the correct updated mileage milestone and upload a new photo of your odometer. Once your mileage update is approved, you'll be able to click on the "order badge" link from your profile to order your next badge. Are the Cummins grill badges durable? How are they affixed to my vehicle? Cummins die-cast grill badges are durable and weather-resistant. Each grill badge comes with a nut and washer so that it can be securely fastened through your vehicle’s grill. What size are the Cummins grill badges? Each Cummins grill badge is three inches in diameter. What happens if I reach a million miles? We certainly hope that you do reach a million miles! Once you reach a million miles, you will be eligible to become a member of the Cummins Million Mile Club, an exclusive club for our customers who have reached a million miles or more with their Cummins engine. What if I’m not the original owner of my Cummins-powered vehicle and didn’t accumulate all of the miles myself? No need to worry if you are not the original owner of your truck. As the current owner, you can take credit and be rewarded for all of the miles accumulated. I had a ton of miles on my previous Cummins-powered vehicle, but I traded it in for a new one. Can the miles accumulated on my previous vehicle count toward my current mileage? Only the miles accumulated on your current vehicle are counted. This allows all grill badges to properly represent the vehicle on which they are placed. We’re thrilled that your last Cummins-powered vehicle gave you miles and miles of dependable power, and we can’t wait for you to build up the miles on your new one! Does my Cummins engine have to still be in the same vehicle into which it was originally installed? As long as your Cummins engine is still powering a comparable vehicle, you are eligible to join the Cummins High Mileage Club. I drive a Cummins-powered vehicle for the company I work for, but do not own it myself. Am I eligible to join the Cummins High Mileage Club? As the driver of the truck, you are eligible to join the High Mileage Club even if you do not own the truck. I don’t drive my Cummins-powered vehicle often enough to accumulate a lot of miles, but I still want a Cummins grill badge. Are there any other ways to get one? 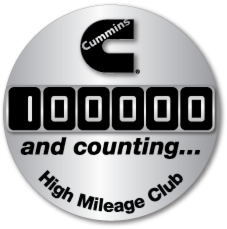 The mileage badges are intended exclusively for members of the Cummins High Mileage Club. These badges are not available for purchase elsewhere. You may, however, be interested in purchasing a Cummins Power badge. They are available to the general public. What if I lose or misplace my Cummins grill badge? Can I get another one? Absolutely! If you lose your Cummins grill badge, you can simply click on the "Order badge" link on your profile to order a replacement.